Saturday Mornings at my house consist of some wonderful sweetness for breakfast this time of year. Donuts, sticky buns, french toast: pick your poison. We allow ourselves a treat one morning a week. It makes Saturdays special for the kids, and happens to go wonderfully with a cup of coffee for me. If I am going to have this sticky sweet calories I am going to make them worth every bite. I decided to mix up our morning sticky buns by making them full of autumn flavors. 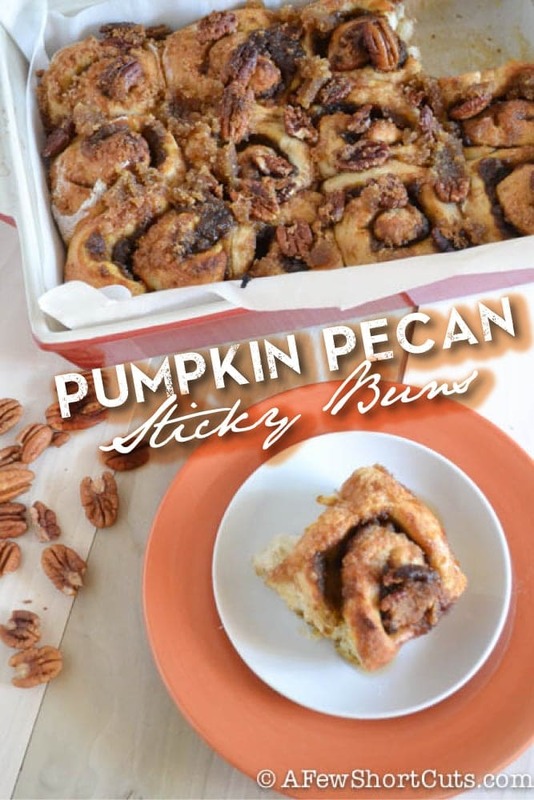 Check out these Pumpkin Pecan Sticky Buns. The smell coming out of my oven was so intoxicating that I am pretty sure I had half of the neighborhood kids at my door. I took a short cut this time and used frozen pre-made bread dough. I love making my own dough, but I just didn’t have the extra time today. I just thawed the dough and rolled it out to a large rectangle. In a small bowl mix the pumpkin, brown sugar, and spices. Spread the pumpkin mix evenly over the dough. Then roll it up. Long side to long side. Slice the rolls into 12 even pieces, about an inch thick. Place the rolls into a parchment lined 13×9 inch pan. Then top all the buns with the sticky pecan mix, and bake at 375 degrees F for 30-35 minutes or until golden brown. Thaw the dough and roll it out to a large rectangle. Slice the rolls into 12 even pieces, about an inch thick. Place the rolls into a parchment lined 13x9 inch pan. In a small bowl mix all of the ingredients together well. Crumble over the tops of the buns before they go in the oven.